If we’re using the Friends spectrum, I’m a Rachel-Phoebe hybrid. In the past, I’ve been a Chandler-Phoebe, and when I’m really hungry, I can relate to Joey. Mostly, however, I’m a Rachel-Phoebe. I’ve never, ever, ever been a Monica. First, I hate cleaning. (Ask my husband!) Second, I’ve never dated my childhood dentist, nor a wannabe-wrestler. And third, I never planned my dream wedding. When Monica and Chandler got engaged, Monica pulled out a giant binder - a color-coded and organized guide to her perfect wedding. I’ve never been that type of woman. I didn’t have a dream venue, or a dream cake, or dream decorations, and I really didn’t have a dream dress. This confused some people when we got engaged. (“What! What do you mean you haven’t already chosen the venue, flowers, and decorations!? How do you not know?”) For me, my dream wedding was a combination of my future husband and I, a melding of our personalities, our families, and our cultures. I couldn’t plan that beforehand! So, when Christian and I set out to plan our wedding, many questions loomed. (Many!) But the one we’ll focus on today, that is related to the blog and fashion, was the dress. 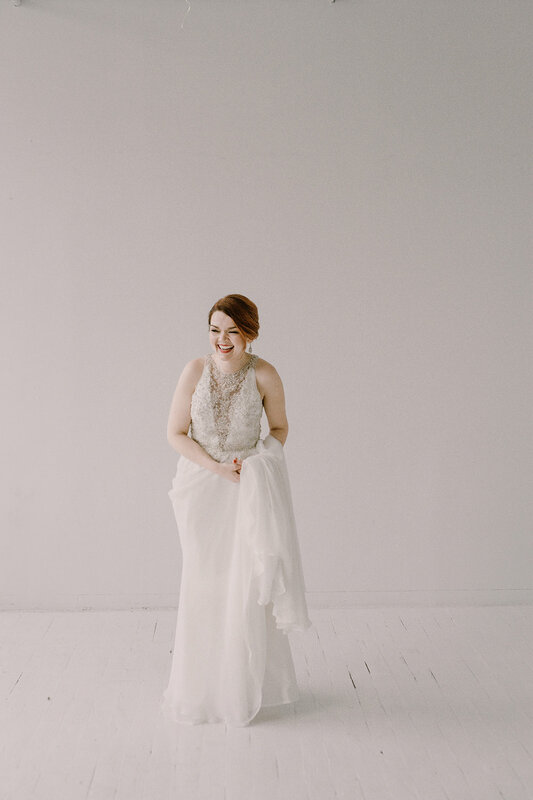 When I wrote our engagement blog post, I closed it with the question, “Will I be a rule-breaking bride?” I think my dress qualifies as rule-breaking. Let’s throw it into the Costume Parade lab report to find out! THE BROKEN RULE: Never wear anything too revealing. THE OUTFIT: When my mom and I strolled into I Do Bridal for my first dress appointment, we didn’t anticipate it would be my last. I came equipped with a vibe of what I wanted, and a specific list of what I didn’t want. I tried on four or five dresses. All of them beautiful, but not quite right. My stylist, Jennifer, got a gleam in her eye, said she had an idea, and disappeared into the rows of dresses. She came back with my dress. Once it was on, it was a whole different story. When I saw myself in that dress, it was the first time I looked at my reflection and felt like an adult. This may seem odd. I’ve been a legal adult for some time now. But for someone who’s routinely carded, asked if she really has a real estate license by condescending middle-aged men, and is always cast as children (or pets), looking adult is a big deal for me. That’s how I knew it was the right one. So, what’s so adult about it? It’s sheer. (SHEER!) The back is entirely sheer and covered in sparkles, and the front has a deep V, also covered in the same sparkly beadwork. Never would I have thought I’d have a sheer dress, but my sheer dress was just right. THE EXPERIENCE: When I came home after finding the dress, and told Christian that dress shopping was over, that I had the dress, he didn’t believe me. I repeated, “No, really. I ordered my dress today.” about four times before he accepted it. Outside of that, I didn’t have any expectations of my dress. I didn’t really care what other people thought of it. I just wanted to feel like myself, and I wanted Christian to be excited to marry me in it. I think this dress checked both of those boxes. THE CONCLUSION: If we pan out for a brief moment, I can see how others would say this dress wasn’t very rule-breaking. First, it’s white. Second, it’s long. Third, it has a bit of a train. All three are common in a traditional wedding dress. But here’s my kicker - if I hadn’t done this Costume Parade rule-breaking experiment, I don’t think I would have chosen that dress. I wouldn’t have been in the right mindset. Instead, my dress would have been far more covered, far more “royal wedding” where they look very classy but don’t show their elbows. And that would have been fine! But my dress was the perfect representation of where I am, now: ready to take more chances, and changes, and adventures - the perfect representation of what I hope for in our marriage, too. So, now I have lots of questions. How did you choose your wedding dress? Did it surprise you? Was your experience similar to mine, or far different? Are you interested in reading any other rule-breaking wedding related content? Please let me know in the comments! I’m so curious to hear your thoughts and experiences. My dress is from I Do Bridal. The illustrious Michael Angelo Ledezma did my hair, and my makeup was done by the incomparable Tori Page. I’ll be back on Wednesday for a spooky, witchy, special Halloween post!